Trim Time, Northampton Street, Leicester. There were a few more photos I wanted to share from my amble around town on Sunday. 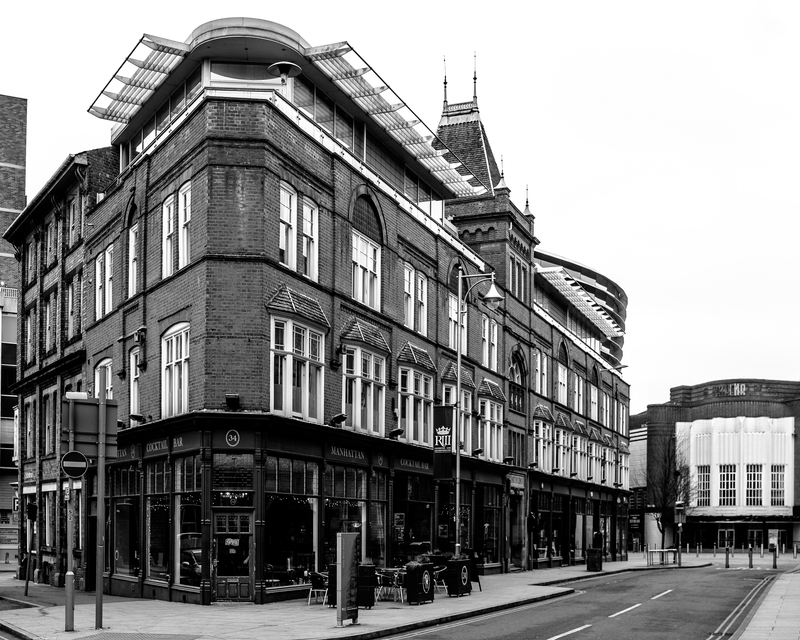 The first, above, was taken on Northampton Street looking towards Granby Street. The clock from which the photo gets its title belongs to the barber shop that my dad used to drag me into when I was a lad, not quite literally but it would be true to say that I didn’t like getting my hair cut. As I got older I kept going to the same place. It used to be “Shilton’s” and I did ask the obvious question about thirty years ago but no, no relation to the one time Leicester City and England goal keeper. I liked the conflict of the word “trim” with the state of the clock and the building at the end of the street which also looks rather the worse for wear. 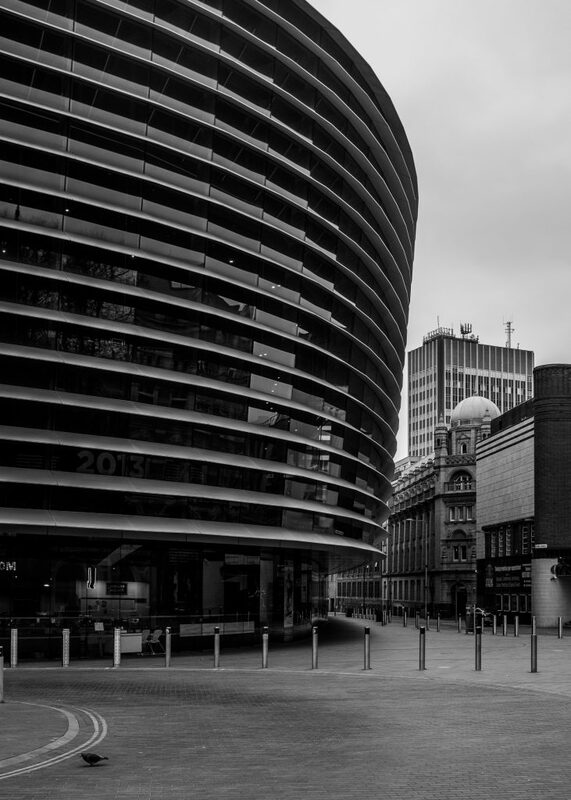 Curve Theatre, Rutland Street, Leicester. I’ve only been inside The Curve twice in my life to date. Once to see “Of Mice And Men” and again to see “The Importance of Being Earnest”. I should check their schedules more frequently than I do but I’m often put off by the number of musicals they put on here. I’m “not a fan” of musicals. I love music. I love drama. The musical just seems like the lowest form of both to me. Anyway, I was passing by during my quest for street art and thought I’d snap a photo. The building to the right with the dome above the entrance and the tower block looming behind is called Alexandra House and features some rather elaborate carvings, particularly around the entrance. Exchange Buildings, Rutland Street, Leicester. Built in 1888, I don’t know anything of the history of these buildings. They are now shops and offices but the name makes me think of financial institutions. I like Victorian architecture and this is a fine example right next door to the Curve Theatre. Something tells me that the theatre might not look so grand after it has stood for 130 years. 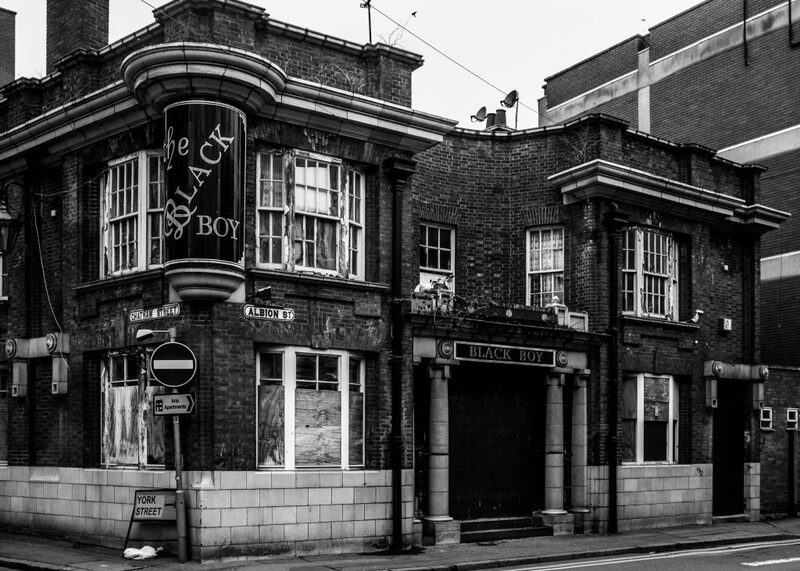 The Black Boy, Albion Street, Leicester. The Black Boy stands (just!) on the corner of Albion Street and Chatham Street. I’ve never been inside, my memories of the place go back to the 1970s when I was a lad and my dad worked at the other end of Albion Street (more of which later). Sometimes my sister and I would be driven out by our aunt to collect my dad from work on a Saturday evening and we would park up along Albion Street to wait for him to leave work. The Black Boy would be lit up at the end of the road with people heading in there after work or just starting their Saturday night out on the tiles. I know somebody had been wanting to demolish the place to make way for yet more student flats but I think the planning application was turned down. Quite what will happen to this lovely old building I can’t guess. It would be great to see it restored to its former glory and used as a pub once again, but in the current economic climate and with pubs closing down in droves I sadly doubt very much that will happen. Young’s Cameras. “Camera Corner” – Belvoir Street and Albion Street Leicester. Young’s Cameras was where my dad worked for most of his working life and stands at the corner of Belvoir Street and Albion Street, the opposite end of Albion Street to the Black Boy pub above. 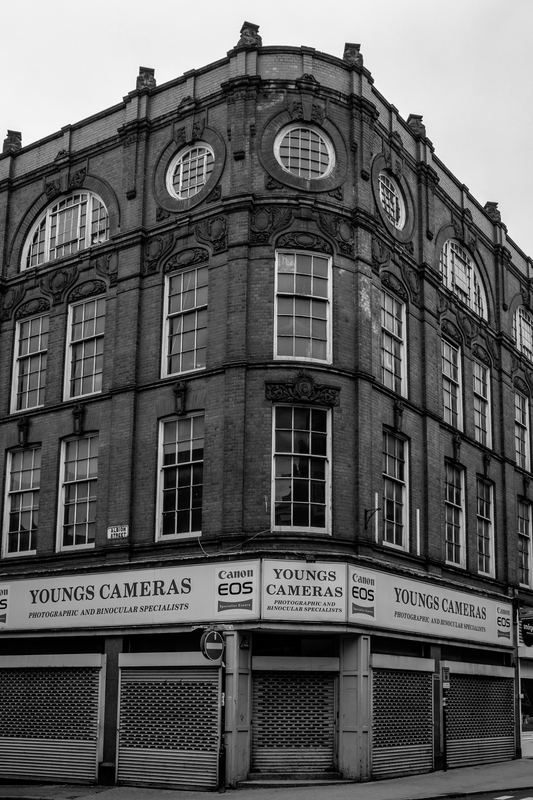 Young’s had started off as a chemist’s store in the late 18th Century and sadly closed down back in 2010. 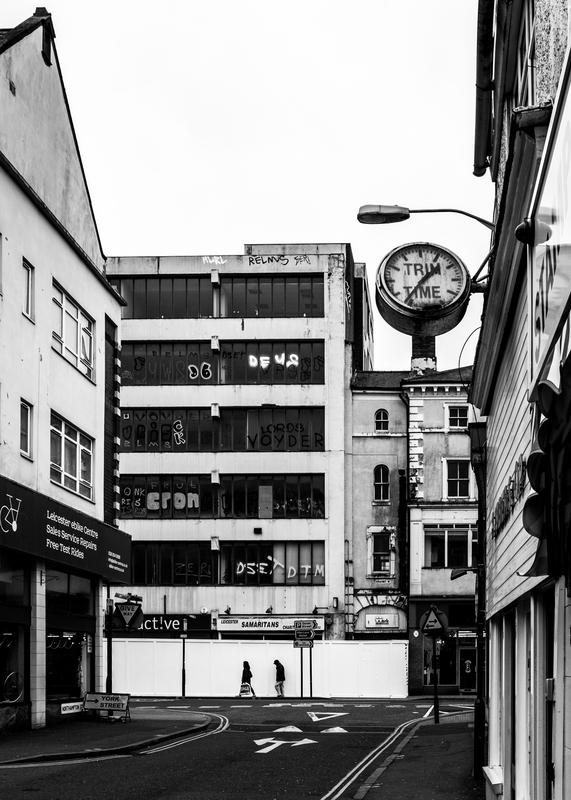 Eight years later the shop still stands empty, a sad testament to the “centre of gravity” in Leicester having shifted hugely towards the Highcross Shopping Centre across town and the fate of many bricks and mortar retailers as online shopping took trade away. As a kid back in the 70s I would occasionally have the treat of going into work with my dad when school was closed for some reason. I was trusted to be down in the basement alone, surrounded by heaven knows how many thousands of pounds worth of stock and deadly chemicals. The then owner, Mr Young himself, was a kindly man who I remember with great fondness. He would often come down into the basement to bring me a cake from the shop around the corner, a photo book I could have or maybe there was a little “job” I could do to “help out” (and keep me amused and out of mischief). I’m sure it wouldn’t be allowed today. All photos taken with my Fujifilm X100T.